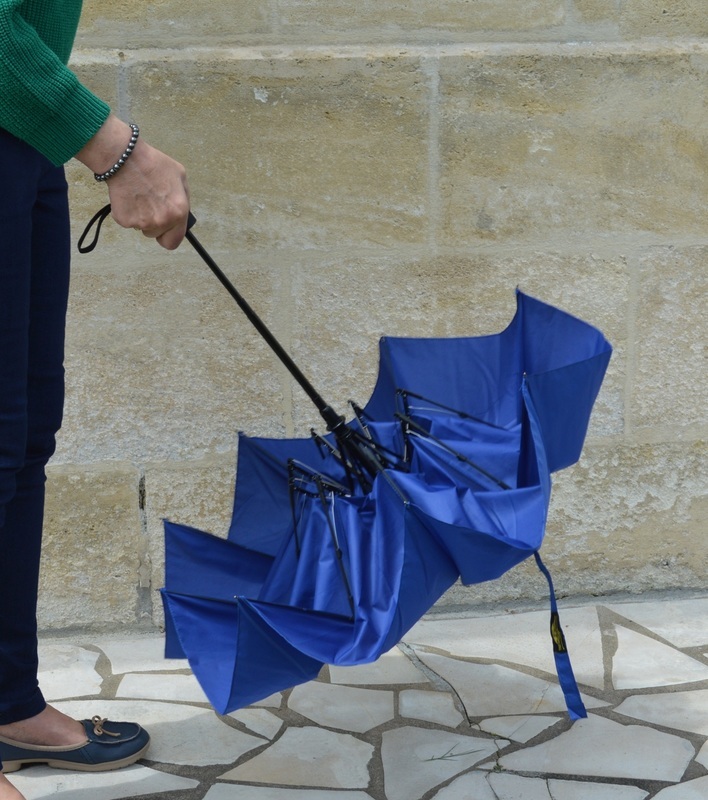 I have owned enough fragile umbrellas that, at one stage, I would rather put up my hood and get soaked on the way to the bus than fight with one of the useless things. 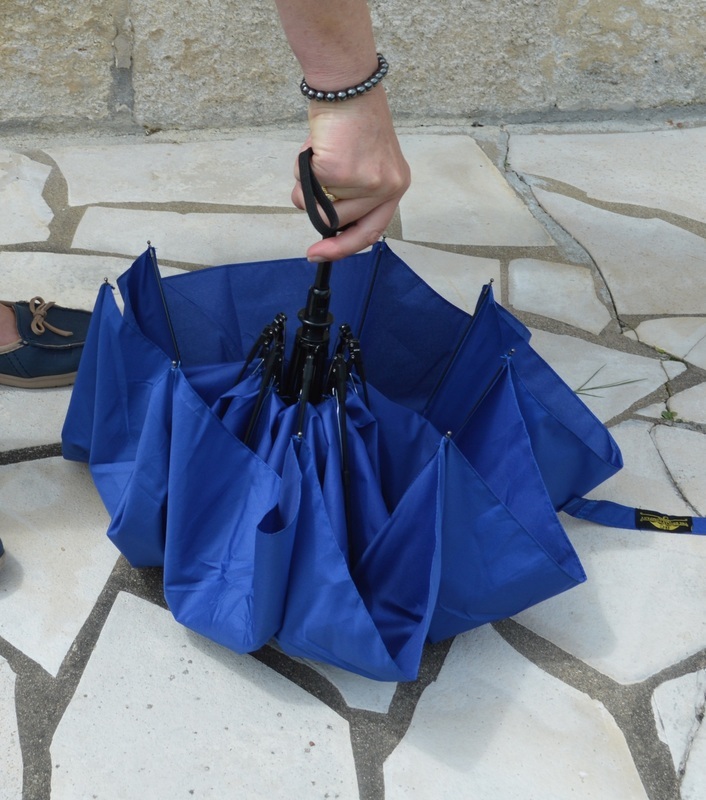 Apart from turning over in moderate wind, filling my shoe with water when emergency-closed, and getting stuck on other people's coat pockets, many of my previous so called "foldable" umbrellas had a habit of breaking in mid-fold. 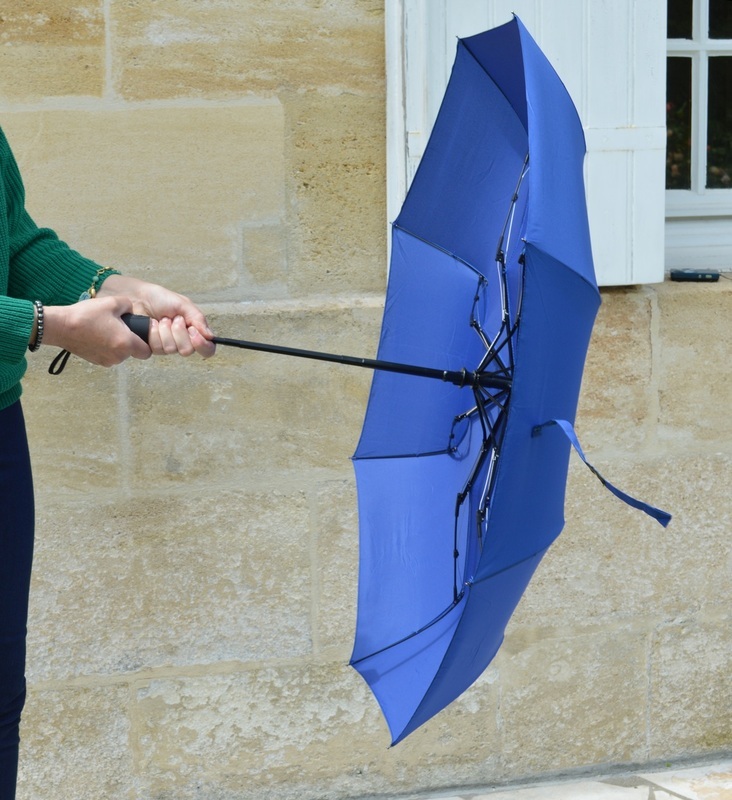 This self-folding umbrella is a very different story. Light and extremely small when folded, it deploys to a very useful size, easily spanning two pairs of shoulders, if needed. 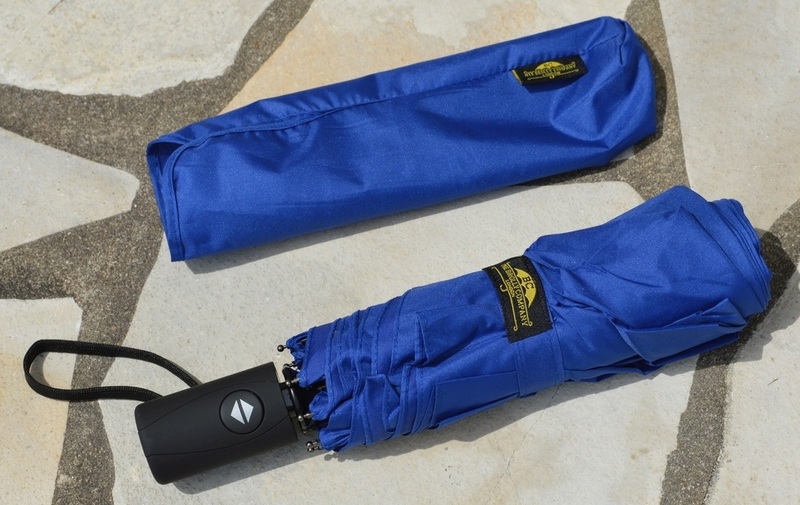 It's much smaller than the old-style folding umbrellas because the ribs break into three instead of two segments. 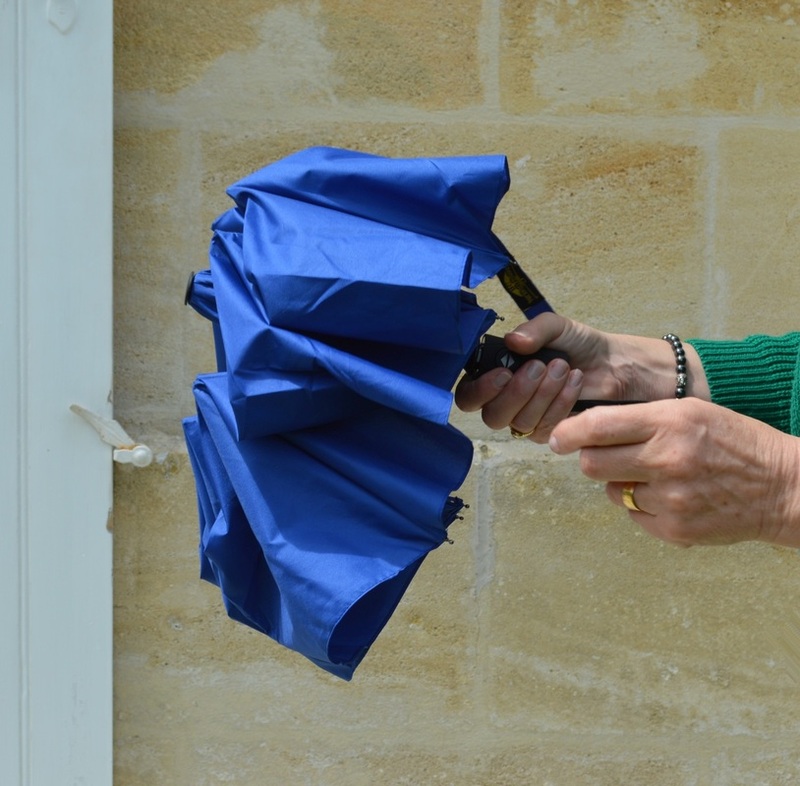 The handle is grippy, thick and easy to hold, although quite short, and there is a loop to slip over your wrist for security. 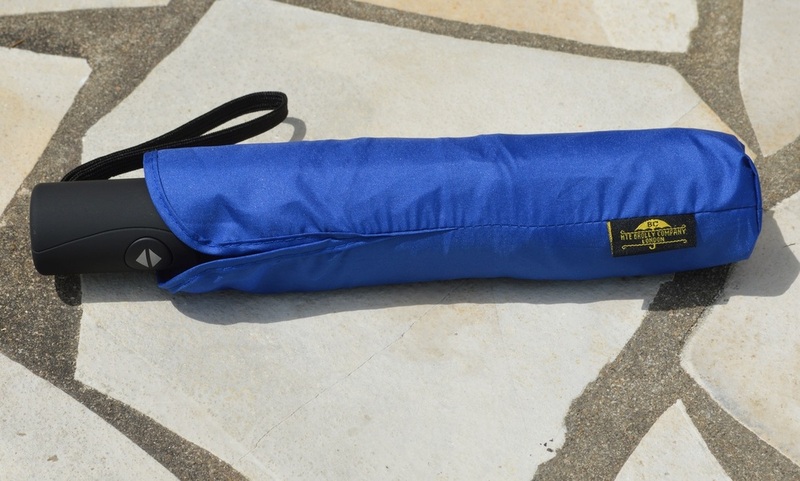 The protective sleeve is a simple sheath made of the same fabric (no zip to catch bits of material) and, surprisingly, it's very easy to push the folded umbrella back inside (after tightening and securing the folds with the little Velcro-ed strap provided). 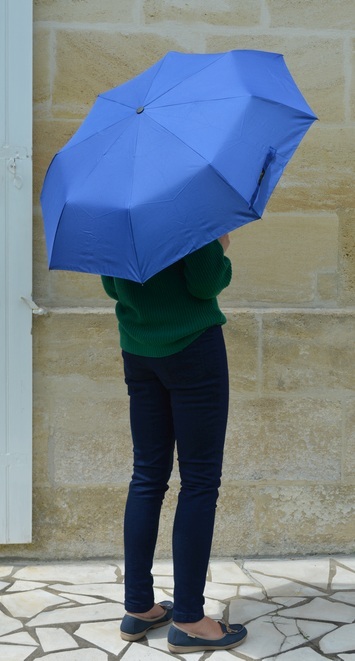 To open, one push of the two-way button releases the full canopy with a strong and very fast action which can take one by surprise. 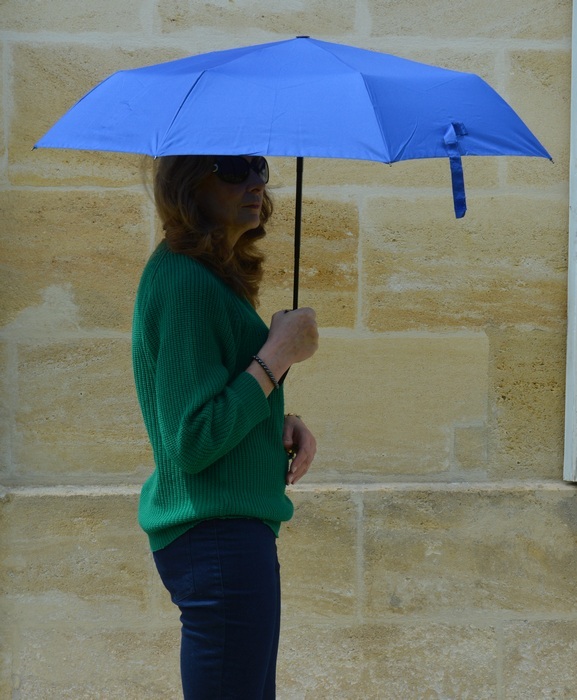 This umbrella needs a lot of clear space to open into, so point it away from yourself and others, before you press that button! To close it, you press the same button and the ribs snap shut with equal vigour, gathering at the top of the handle. 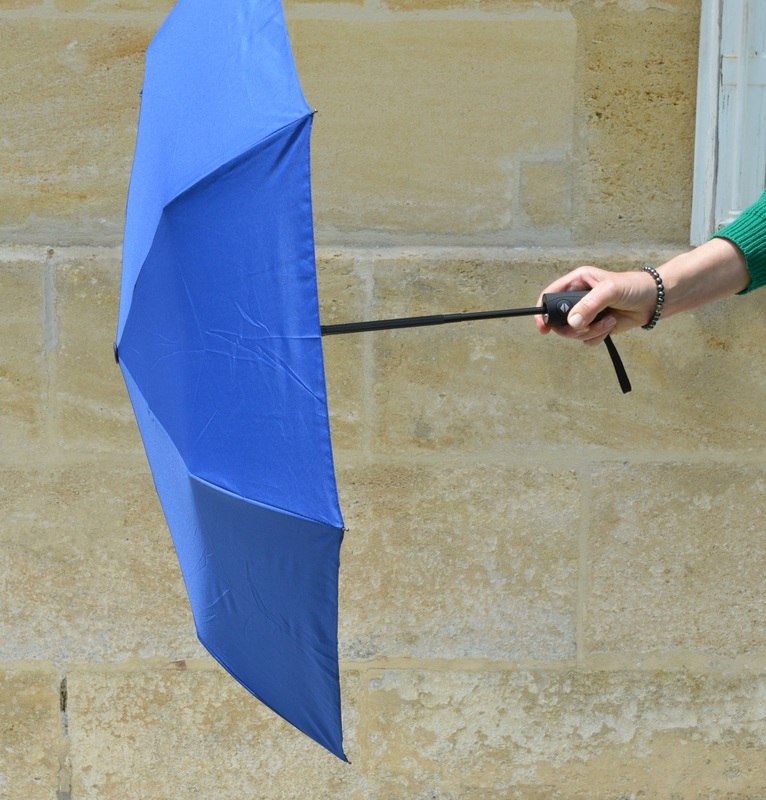 To complete the process, the best way is to place the flat end of the umbrella against your palm (or against a wall or even the ground) and push strongly until it clicks shut. It's now ready to slip back into its sleeve but make sure not to touch that button again! The ribs look very elastic and capable of withstanding a fair wind even should they turn over. While we were photographing it, the wind picked up and I was able to watch its impressive self-righting act. Finally, with its 3-year guarantee, it's a very competitively priced choice. 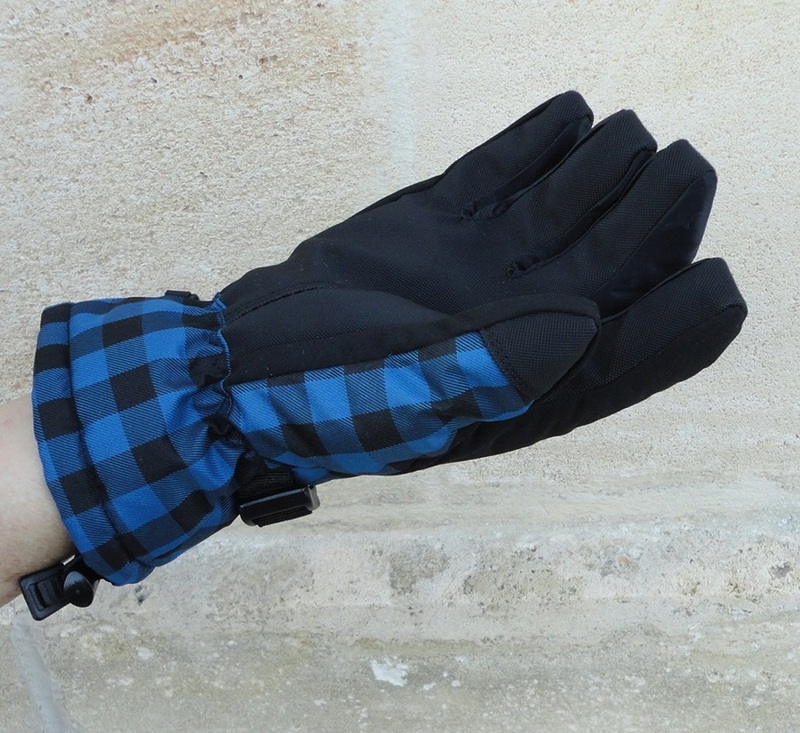 These gloves are fantastic! They were sent to me at no cost to evaluate and I was very pleasantly surprised by the quality and the fit. My husband does not have very big hands for a guy, but his fingers are long and usually needs a size 10+ glove. 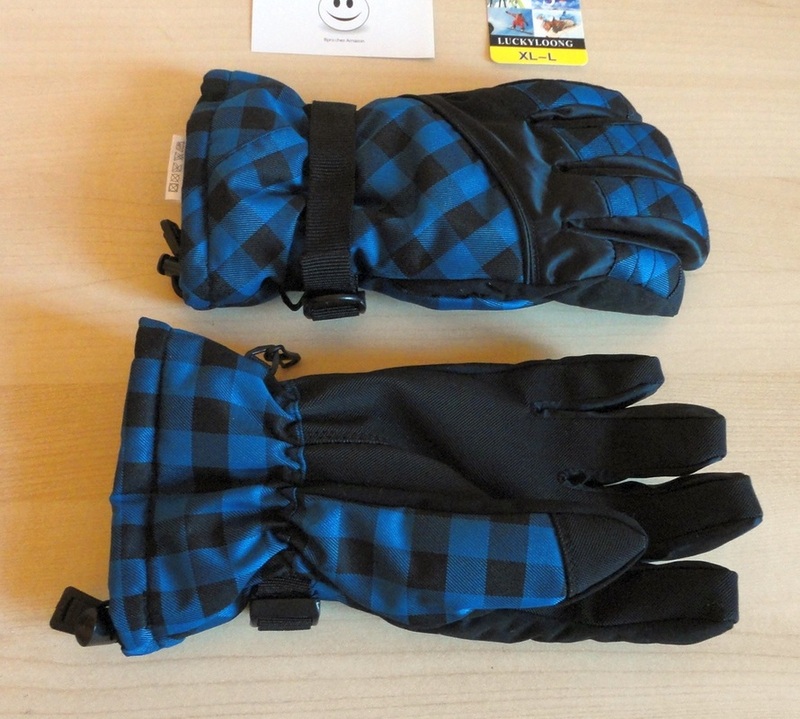 These gloves are offered in one size (XL) and for him they are perfect. Since they are thickly padded, he feels that they would indeed fit a large variety of hands. The long gauntlet-style cuff reaches well over the lower arm and can be tightened very easily by pulling the strap over the wrist. Lifting the hard-plastic tab releases the strap to facilitate taking the gloves off. The end of the cuff can also be tightened by means of an elastic band (a little more fiddly to do with one hand) to completely exclude snow, for example. 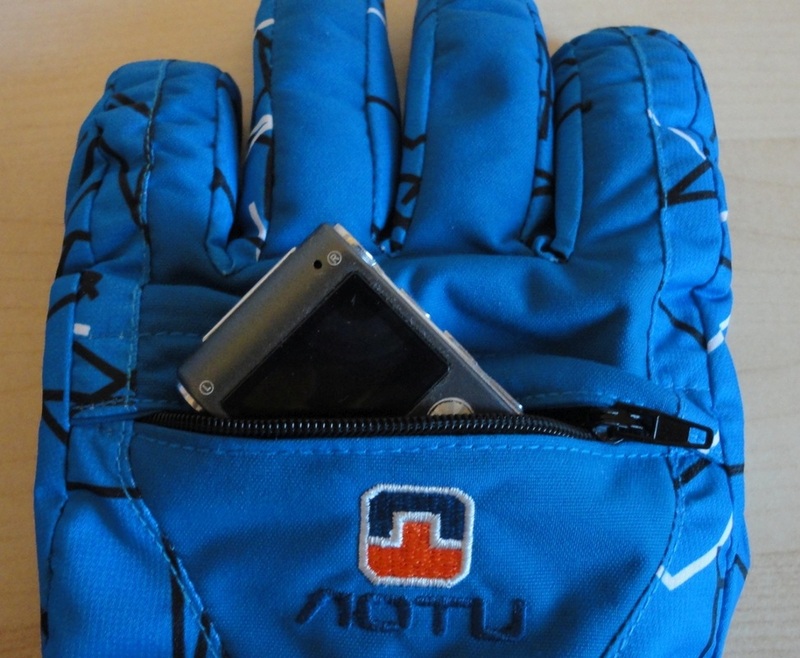 The material over the palm of the hands offers some grip without making the glove too stiff. Over the back of each hand there is a small zipped pocket (discreetly concealed) big enough to hold a credit card, or other small object. 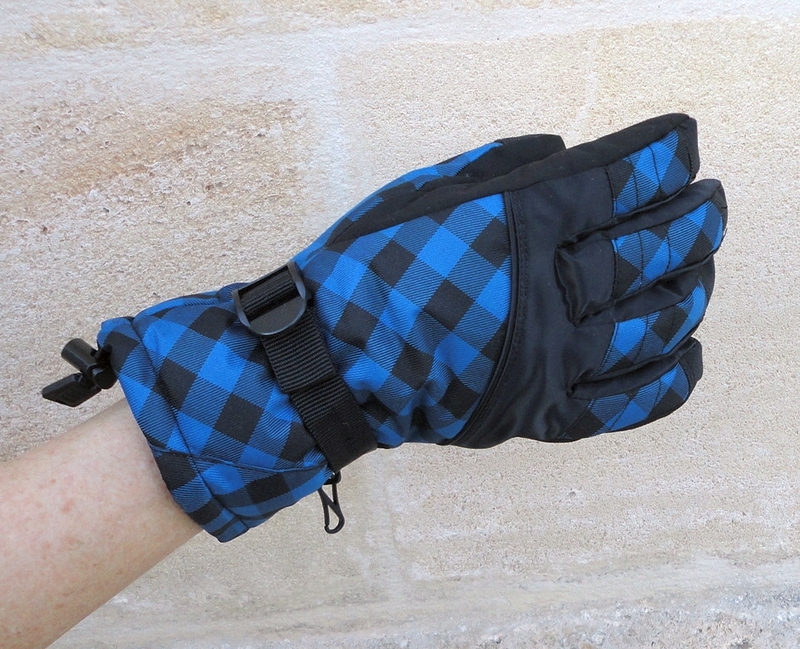 Although these are described as ski gloves, I feel that they would work very well as cold-weather gloves for many types of outdoor activities. 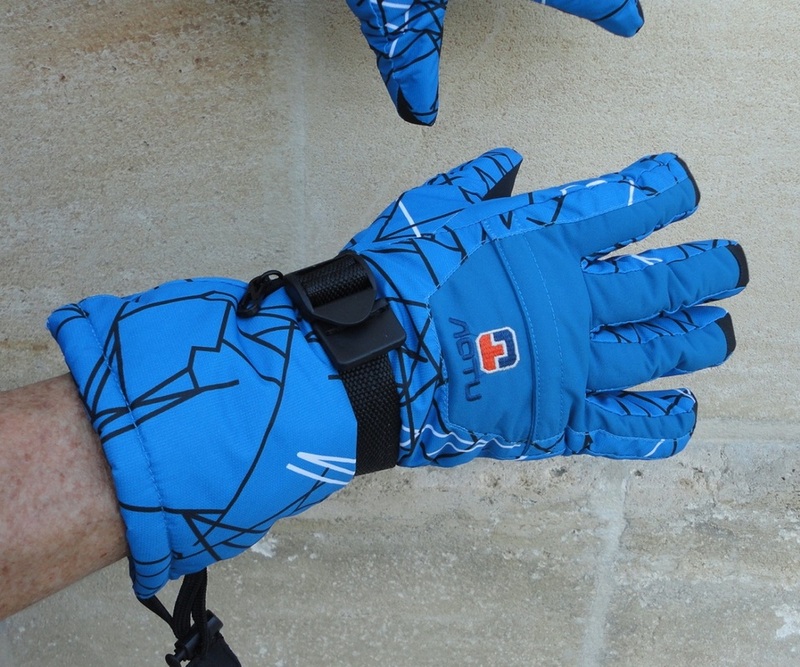 They are very warm, very soft, lovely to wear and waterproof. They are also very snazzy, and in my favourite colour. 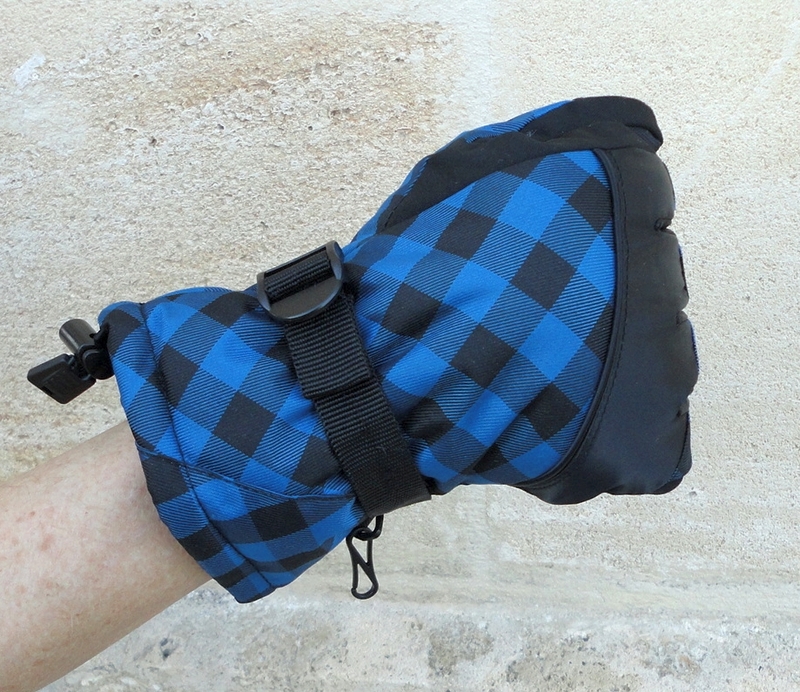 Fabulous, well-padded winter gloves. Sent to me at no cost to evaluate, I was very pleasantly surprised by the quality and the comfort. My hands are medium-sized for a woman, normally I buy gloves in a size 9. 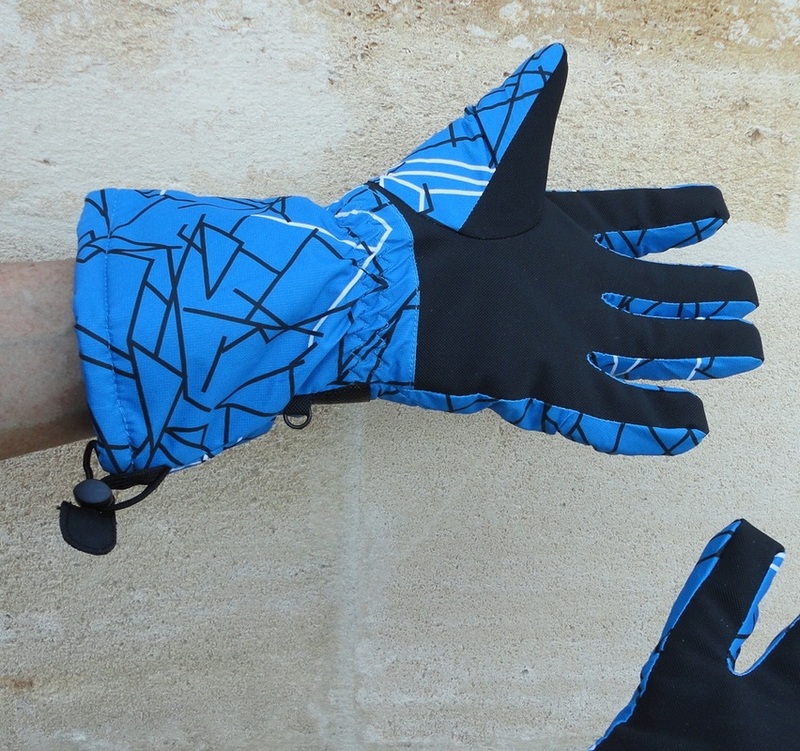 These gloves are available in two sizes (M and L) and three colourways. I opted for the Large size in Blue and they fit me perfectly. A short gauntlet-style cuff reaches well beyond the wrist and can be tightened very easily by pulling the strap over the wrist. Lifting the hard-plastic tab releases the strap to facilitate taking the gloves off. 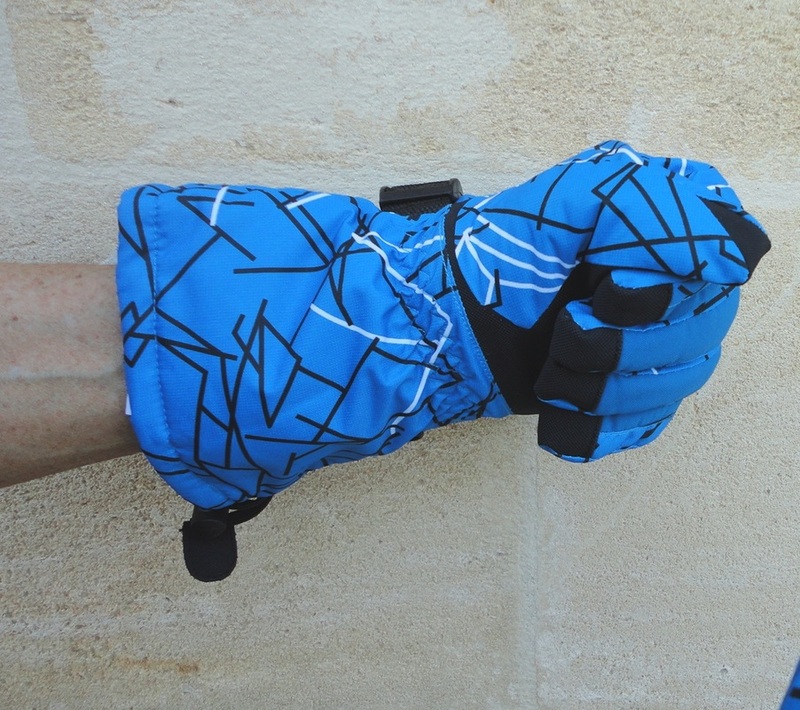 You can also completely seal the end of the cuff by tightening an inner elastic band (a little more fiddly to do with one hand) to completely protect the hands from snow and wind. The palms are lined with a grippy but supple material. The same material runs over the knuckles to reinforce the glove. 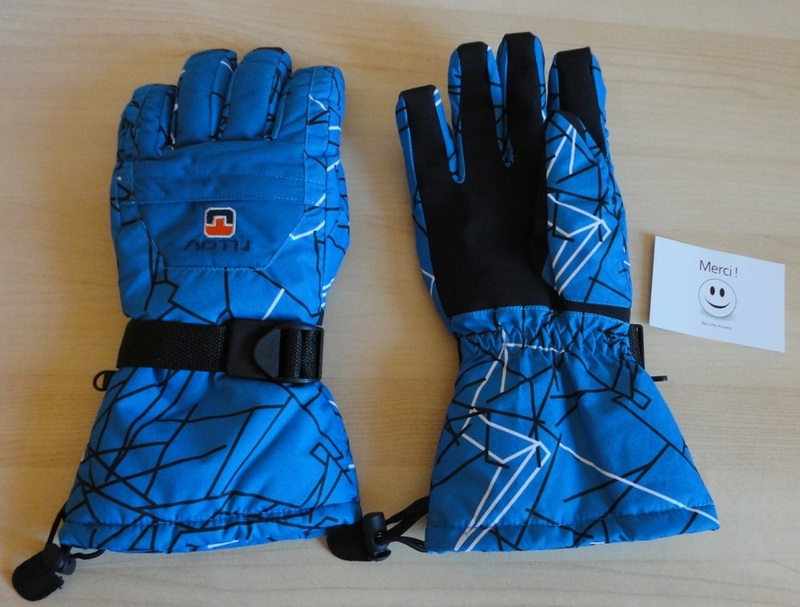 Although described as ski gloves, these are great cold-weather gloves for many types of outdoor activities. They are very warm and soft, lovely to wear and water resistant. We were recently out taking pictures on a sunny but cold day. My normally cold hands quickly become frozen in that type of situation, but with these gloves on, I was toasty warm and did not even notice how cold it was until we got back inside. The check pattern is easy to co-ordinate and looks smart, and I find the price very reasonable for this quality.